By Guest Blogger Lucinda Philumalee. When I attended my first University of Maryland Historic Preservation Organization (HiPO) meeting in the fall of 2008, the president conducted an icebreaker in which the group took turns introducing themselves and sharing their favorite historic site. I had only been out of the South for two months so naturally I declared my love for Beauvoir, Jefferson Davis’s retirement plantation. Beauvoir originally sat on a parcel of land of approximately 600 acres, which extended from the Gulf of Mexico to Back Bay Biloxi, Mississippi. Since 1848, the property has decreased to a twelfth of its original size and although the visitor may still see the beach from the front porch, Highway 90 and its cars obstruct the view. 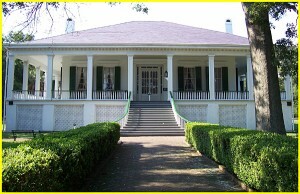 Although the raised Louisiana cottage still stands, even in lieu of Hurricanes Camille in 1969 and Katrina in 2005, a significant portion of Beauvior is unable to be experienced by the present visitor since the cultural landscape has been destroyed. The elimination of outbuildings, forestry, and the orange grove (so often noted that a nearby town was named for it) decreased historical viewsheds, which in turn diminished the integrity of the visitor experience. Historic preservation is not solely about the conservation of the built environment, but also about the natural site that surrounds it. When an architect designs a structure, site analysis is a component of the process; therefore preservationists should take into account the thought behind that process and make all attempts to conserve a site, built and natural.